Early payout, or more particularly Blackjack Basic Strategy with Early Payout, is a trademarked game from software developer Vuetec, offered by its licensee casinos, including Dublinbet. 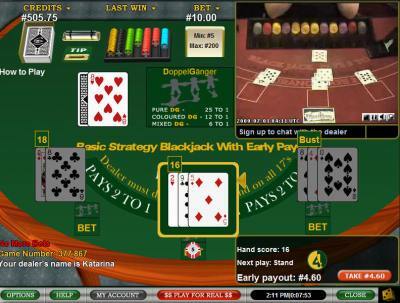 The game enforces mandatory basic strategy play, with a surrender option offered at each stage of the deal. This is quite a departure from a normal game of blackjack, as a lot of the decision making that is part and parcel of the game (hit, stand, double down, split etc) is removed. On the upside, the fact that basic strategy play is enforced means that game returns, particularly for inexperienced players, will be better than returns playing regular blackjack. As it also happens, all Vuetec powered live casinos take their video stream from a real bricks and mortar casino rather than a dealer studio (as most other live casinos do). The casino which the dealer is dealing from is Dublin’s Fitzwilliam Card Club and Casino.